The highly praised short film, which featured their celebrity friends like Kanye West, Lindsay Lohan and Olivia Wilde, was directed by Jared under the alias Bartholomew Cubbins. 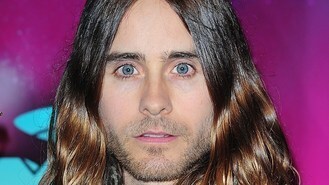 Jared also hired Michael Jackson, Superman and Marilyn Monroe impersonators and homeless people for the video. The frontman said: "I don't know. We did release a short film for City Of Angels and it was an incredible experience. "We have Kanye West, James Franco, Selena Gomez and Lindsay Lohan, and Superman, Marilyn and Michael Jackson are all in the short piece. It was wonderful to create this story about our home," he added. The movie was shot over two days in August in Los Angeles, and includes multiple monoliths and murals. Actor-singer Jared, who scooped the gong for best alternative act with his group at the MTV Europe Music Awards, also joked that he didn't mind Miley Cyrus' skimpy outfits at the ceremony. She flashed her flesh in a backless mini-dress on the red carpet, before taking to the stage in a silver latex dress, followed by a white high-cut leotard. "I wasn't mad at it. I'm not going to complain," he said. Jared used his acceptance speech to highlight the tragedy of Typhoon Haiyan in the Philippines. "There's a terrible tragedy that just affected a great number of people - many people have died, many people are going to be displaced - and they are in turmoil right now," he said. "As we celebrate in one part of the world, I think it's completely legitimate and appropriate to send an acknowledgement their way. We're in a very fortunate situation right now."